Lulea and the surrounding area in Swedish Lapland is a land of complete contrast. With an archipelago of over 1,300 islands, vast woodland and river valleys it hosts a wealth of charming experiences for an unforgettable winter holiday. This 4-night break combines the breathtaking archipelago with the frozen Bothnian Bay your playground and the iconic Treehotel located in the middle of unspoiled nature for a unique overnight experience. Situated just below the Arctic Circle, this area is also a great location for those in search of the phenomenal northern lights! Your adventure begins in the Lulea Archipelago, a vast landscape of snow and ice across the frozen Gulf of Bothnia to the horizon in the distance, a truly mesmerizing place – and the perfect setting to try your hand at winter activities. Just a 30 minute transfer from the city of Lulea. Brandon Lodge is located on an island surrounded by frozen sea and comprises of cabin style accommodation for up to four people, each with two bedrooms, bathroom and lounge area. Its main building houses the restaurant and comfortable lounge area to relax. At the lodge we have included three wonderful activities - husky sledding, snowmobiling in the forest and a northern lights sled tour. There are also other fantastic choices available to pre-book, such as a hovercraft tour, Nordic winter skills, northern lights snowshoe walks, ice fishing and a romantic dinner on ice. After time on the archipelago, you are transferred to the small village of Harads for the last night spent at the Treehotel, a unique and very special way to end your stay in Swedish Lapland. The inspiration of Kent and Britta Lindvall the Treehotel offers seven different tree rooms with contemporary design suspended 4-6 metres above the ground, some with spectacular views of the Lule river valley. Choose from the Mirror Cube, The Cabin, The Nest, The UFO, The Blue Cone, Dragonfly and The 7th Room, each with an individual theme. When you arrive, you first check-in at the Guesthouse, a very welcoming and cosy lodge, this is where the fantastic home cooked meals are served. Then it's a few minutes walk through the beautiful forest to your tree room for an overnight stay. There are several special extras and activities which can be added to enhance your stay, so why not extend your time here and try a different tree room for the second or even third night! 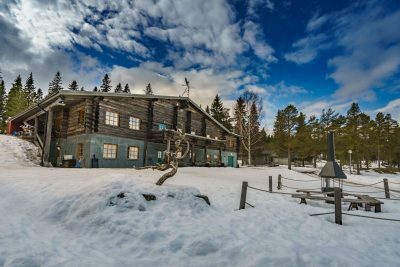 In addition to the tree rooms, there are two tree saunas which can be booked for private use, a jacuzzi bath, Swedish massage and Forest Spa, a romantic wood fired bathtub for two people. 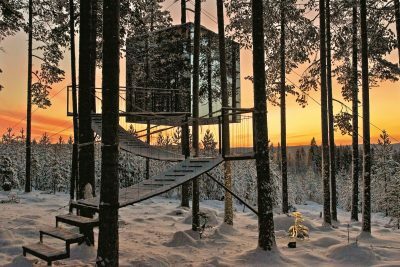 And if you didn't get a chance to experience some winter activities on the archipelago there is a good choice available to pre-book whilst at the Treehotel. *Child price based on sharing with 2 adults. Fly to Lulea via Stockholm. On arrival you are met and transferred to the Lulea archipelago (approximately 25 minutes) to Brandon Lodge for a 3-night stay on full board basis. 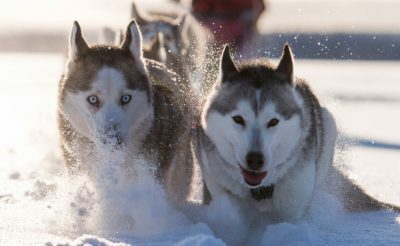 Included are three wonderful winter experiences - husky sledding, snowmobiling and a northern lights sled tour. There are also other optional activities which can be booked during your time on the archipelago. 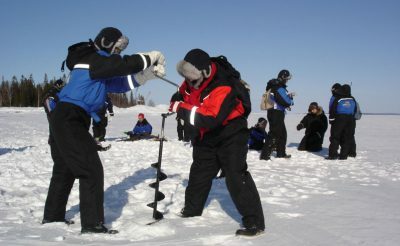 Choose from hovercraft on the pack ice; dinner on ice; aurora snowshoes and ice fishing. 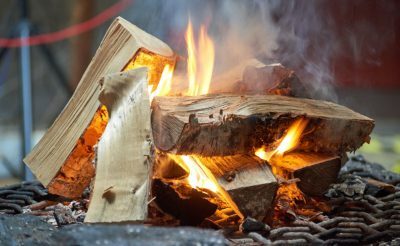 And if you have any spare time, the lodges are a great place to relax and unwind, perhaps warm up in the sauna (additional charge) after time on the snowy trails. Enjoy time at leisure in the morning then after lunch at 2pm, transfer from your accommodation to the village Harads, home to the Treehotel (journey time approximately 90 minutes). On arrival check in at the Guesthouse and then make your way on foot through the forest to your unique tree room. Enjoy the warm hospitality and evening meal at Britta's before your overnight stay in the trees. After breakfast join the transfer back to Lulea airport for your flight home (via Stockholm). 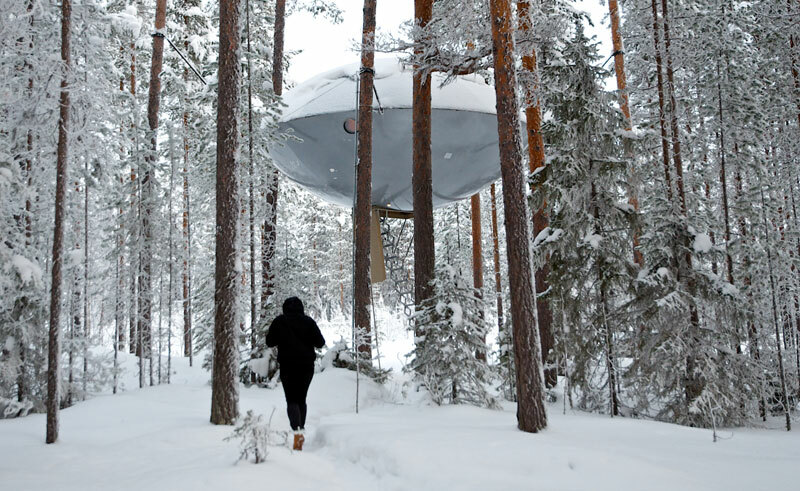 The Treehotel is a special hotel experience situated outside the small village of Harads, a one hour's drive northwest of Lulea and just 60km south of the Arctic Circle in Swedish Lapland. The favorite winter past time of the locals, a snowmobile drive through the snow-covered forests. 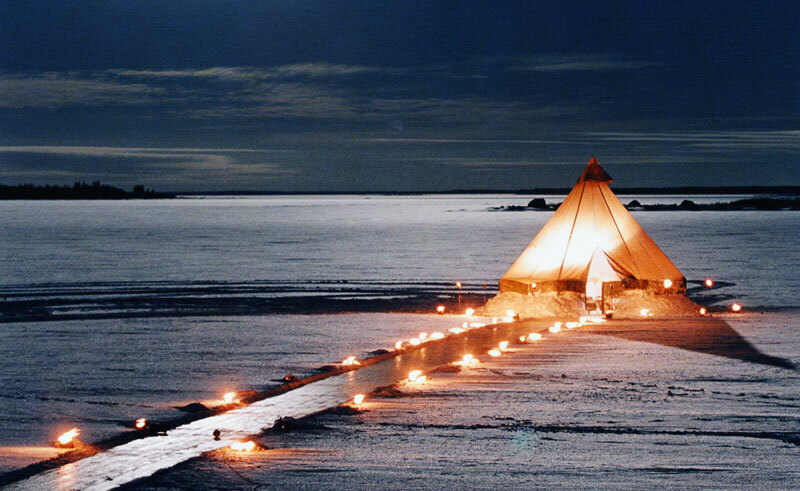 Welcome to a candle light dinner experience with a difference! Enjoy the chance to mush a team of dogs through the forest and over a frozen lake leaving you with some fantastic memories. 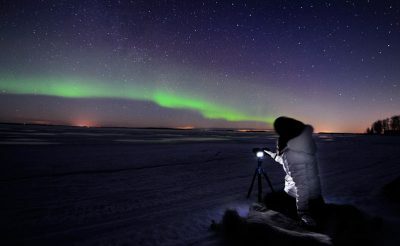 This is a unique and magical way of exploring Lulea’s frozen archipelago. 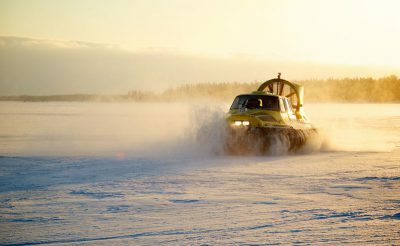 Travel by sled pulled by the guide's snowmobile to a frozen lake, where you will learn how to drill a hole into the ice and how to fish in Lapland. 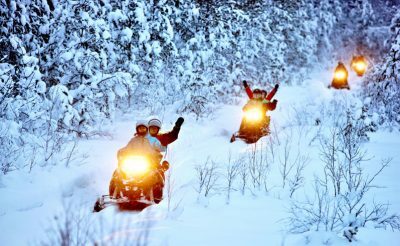 Travel by sled pulled by the guides snowmobile through the forest in search of the Northern Lights*. You will be taken to the frozen sea, far away from artificial lights. Your guide will talk to you about the lights before returning back to your hotel. The longer 3 hour trip includes dinner. 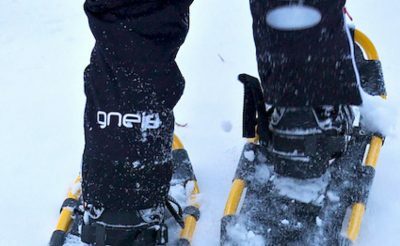 Snowshoes have been used for thousand of years in winter conditions and they really make life easier when the snow cover is thick. 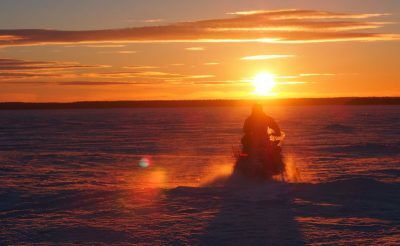 On this excursion take to the glistening ice and islands of the Lulea archipelago on a snowmobile. This 4-night inclusive break is based at delightful Brandon Lodge with an array of winter activities to choose from. A summer fly-drive in Swedish Lapland visiting two iconic and unique hotels. A great 4-night short break for family and friends to celebrate the New Year in Swedish Lapland.